Our recycled notebooks comprise a thick 300gsm recycled board cover which can be printed on one or both sides plus 36 plain text pages on 90gsm paper. Available as a 40 page A6 pocket notebook, an A5 jotter notebook or funky small or large square notebook . As you know we always like to give you more, so take the opportunity to see your designs brought to life by taking us up on our Multiple Sorts option; we give you up to five different cover designs for the same published price! We also offer a recycled option in our Printed Pages Notebooks and Round Cornered Notebooks too. So much choice! Covers are normally printed digitally and inner pages are plain. Please note that it may take up to 9 working days to dispatch from proof approval. All digital covers*. Plain 90gsm text pages. Covers may be printed litho for same costs dependent upon the design. 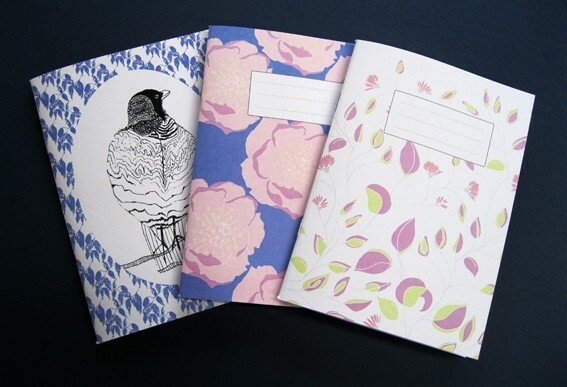 Our recycled notebooks are a fabulous eco-friendly product for retail opportunities, social clubs, promotions and even special events. Available to order with up to 25 different cover versions. Total madness! If you need a quantity over 1000 have a look at our litho printed recycled notebooks which are specifically for larger runs up to 3000. The recycled paper used for our notebooks benefits from the carbon capture programme. All of the carbon generated during the production of this paper is offset by the planting of forests and woodlands in association with the Woodland Trust. Digitally printed covers means that we can print up to five designs for the same price. If you have between 6 and 25 designs please use the multiple sorts option in 'Build Your Order'. 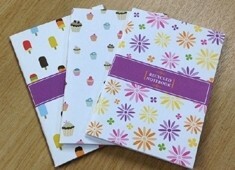 Please note that we do have a minimum order quantity of 10 notebooks per sort. Our new Proofing Service also gives you the opportunity to upload your artwork and order a printed sample on all three of our notebook boards - Recycled, Smooth Premium or Kraft. You can order a full notebook sample or just a cover and gives you peace of mind before you go ahead with a larger order. Designing for Digital Printing has a few rules that you should be aware of to get the very best out of your product. Have a read up on our top tips to ensure your notebook is as stunning as you want it to be. If you want your cover printed inside and out we can do this too. We will need you to conact us for a price by using the Custom Quote button at the top of the page, or by dropping us a line with your specification. Is a Recycled Cover best for me? The recycled board that we use for our covers has a slight texture to it and has thick feel in the hand. It has a 'pulpy' finish which is due to all the lovely recycled fibres being fluffy and puffed up, unlike the Premium Smooth board which is heavier but feels thinner as the fibres have been rolled smooth.